The Las Vegas Running Team presents this annual event at Bunker Family Park. Race starts at 7 AM on July 4. There will be prizes, awards, music, cash drawings, food and fun! The Clark County Parks and Recreation canceled the Red, White & Boom 4th of July celebration that has been held annually at Desert Breeze Park. 4th of July in Las Vegas Events including fireworks. 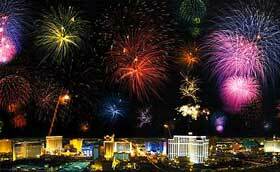 Red, White and Boom, Clark County’s annual July 4th celebration is expected to be the largest event for the 2006 4th of July in Las Vegas. This year’s festival features an expanded lineup of big-name contemporary rock and pop acts, as well as a carnival, games and exhibitions, food and beverage vendors, and a 20-minute fireworks show. Cost: Admission is $17.50 per day in advance or $30 for a two-day pass in advance. Day of show pricing is $22 each day. Kids 12 and under are FREE.